Providing a 1-800 or another prefixed toll-free number is the ultimate show of professionalism to customers. If a potential customer can call your business at any time, from anywhere, for free, they’re more likely to contact your business, compared to no toll-free number being available. 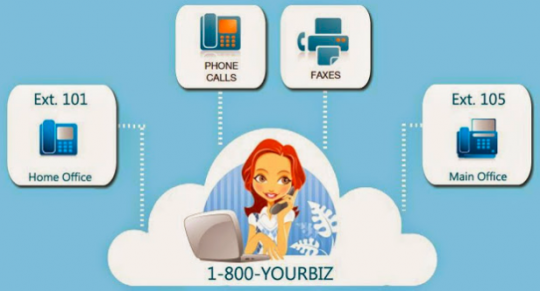 If you want your customers to receive a customized greeting every time they call, you can do this with a virtual PBX. You can announce your business name, address, hours of operation, offerings and other general information to callers. You can also present a set of options (a phone tree) for callers to select from. For example, press 0 to reach the front desk, press 1 to reach the sales department, etc. Virtual PBX systems have very advanced call forwarding capabilities. You can configure one number to provide an announcement and then forward to one or more internal phone numbers, which you don’t publish to your customers. The other great thing about call forwarding is that it can be reconfigured and changed at any time, without the customers seeing any differences. The possibilities are almost endless with the various virtual PBX solutions that are available. Other offerings include virtual answering services, audio conferencing, cloud fax solutions, soft phones/VoIP clients, smartphone apps, SMS/text messaging, and much more.